These Italian biscuits are twice baked meaning that they're baked in a log in the oven for 30 minutes then sliced and baked again for a further 10 minutes. That's where they get their dry, crunchy texture and why they're perfect when served after a dinner party and dipped in tea, coffee or Noel's favourite - white chocolate soup. Take a large mixing bowl and combine the baking powder, cocoa powder, flour, salt, butter and about half the sugar. Stir until smooth. Now add the coffee liqueur, lemon zest and beaten eggs while stirring. Fold in the chocolate chips and chopped almonds. Stir well. Sprinkle the rest of the white sugar over a rolling board. Divide the batter in half and roll into a foot-long log. Place the logs on a greased baking tray. Place in an oven preheated to 350 F and bake for 30 minutes. Lift out of the oven and cut into thick slices. Bake the slices again for another 10 minutes before serving. 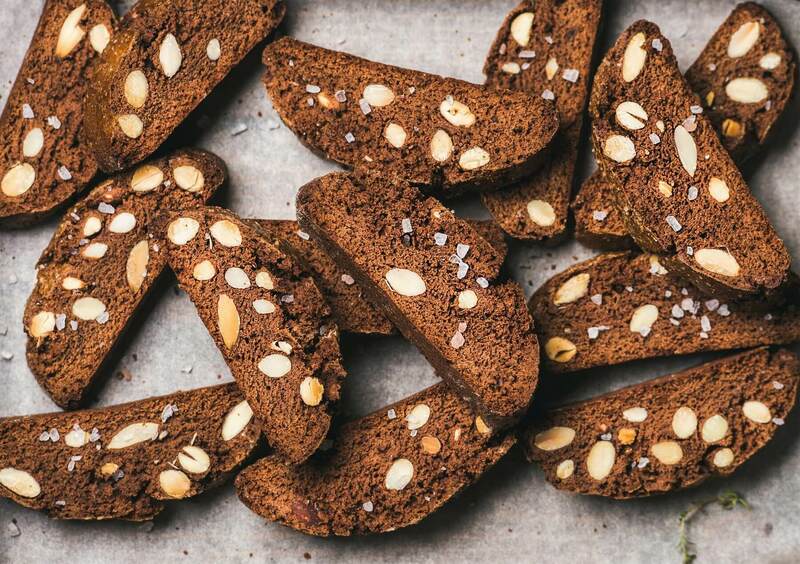 Biscotti should be stored in an airtight container to preserve taste and texture.